The fish that made me fall out of my kayak. Re: The fish that made me fall out of my kayak. I did they same thing too this year at the BCC....except without the mask. Amazing how fast it happens. Good to hear you were well prepared and everything worked out. I guess that's how fast it can happen and if you weren't prepared it could have been much worse. All's well that ends well, Peter. Glad you're OK. 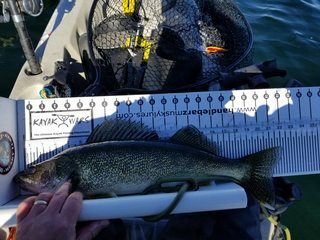 This is kind of an embarrassing story, but I feel obligated to share it with any cold water kayak fishermen. I had just caught my first fish of the day a 22.25in walleye and thought it would be funny to take a selfie wearing a mask with it since tomorrow is Halloween. I had brought a mask out with me and had it stored in my black pac. I was rushing to get it fast, take the pic and release the fish. A huge mistake! I fell out, lost the fish, and ended my fishing day. Now the good part of this story. I was prepared for this to eventually happen to me. All this preparation kept me calm and not panicked during this experience. I was wearing a base layer of wool, a few other layers, had Kokatat dry pants and a Level 6 dry top on. I was also wearing my Kokatat PFD. I wasn't fishing alone. 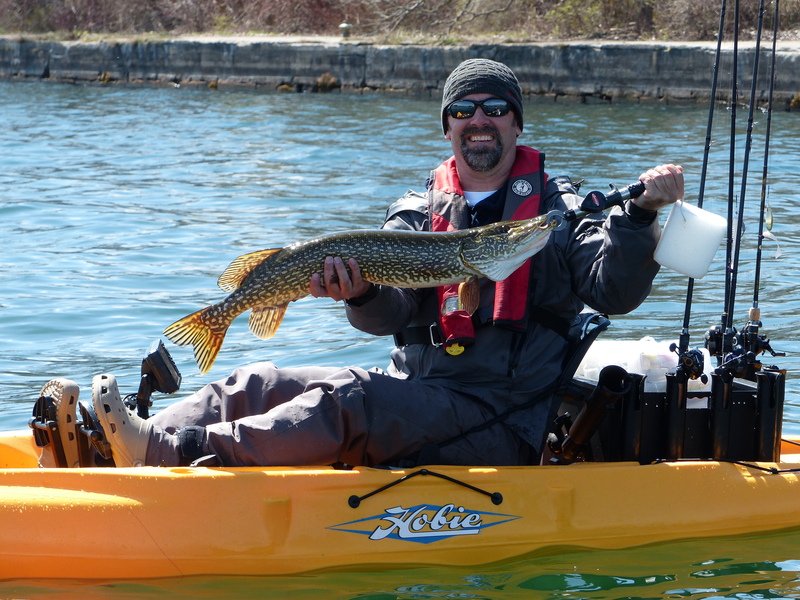 I had my good buddy Scott Barton out with me, who steadied the one side of my kayak so I could pull myself back on. I kept the one side of my Outback clear of gear mounted to it, so nothing to get hung up on. I had a re-entry rope attached to my Kayak. This made getting back in a simple task. I was probably only in the water for 45sec. I did get wet with my 2 piece combo, had water seep in at the waist. There was maybe a cup of water that got in, at my waist and half way to my knees. It was enough to know it was there and end my day in the frigid wind. If I would have had a change of clothes in the truck, I would have went back out. This experience has me wanting a one piece dry suit even more. My top half was completely dry. If I would have been wearing a full one piece suit, I would have re-entered my kayak and kept on fishing. This will be my next big fishing purchase. And the best part of the story.....I didn't lose a single thing apart from the fish and my pride!